Welcome to the Home of QuickVoice Voice Recorder Software, Voice Email Software, and Voice Stickies Software by nFinity, Inc.
QuickVoice is nFinity's award winning, feature rich voice recording software for Mac and Windows computers. Featuring: one click recording, voice email, voice reminders, audio stickies, full featured audio editor, and more.... That's five powerful functions in one tightly knit software app! It's a one-stop audio recording solution for your desktop or laptop computer. Use QuickVoice to record memos, dictations, reminders, ideas, "to do" lists, meetings, phone conferences, interviews, even entire lecture or seminars. Send voice emails, set voice reminders, send recordings to iTunes library, and display high profile audio stickies with text notes on your computer's desktop. You can even drag and using QuickVoice's "Message Pallette" you can drag & drop recordings into Word, Excel, Powerpoint, and other audio supporting programs. QuickVoice is ideal for professional, educational and home use. QuickVoice users come from all walks of life including: doctors, attorneys, scientists, technicians, executives, business owners, sales people, authors, educators, students, musicians, home PC users, and so on. The range of QuickVoice's uses and its user base are unlimited! Macworld Buying Advice . 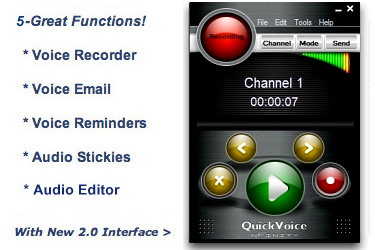 . .
"QuickVoice is inexpensive, smooth, cool, stable and useful. Great for capturing audio into the Mac. Loose your imagination. Send voice emails, create recorded audio notes, record interviews and meetings on the job. Use it to capture sound files and then move them to other programs. It is well worth the price of twenty bucks! QuickVoice and Voice Stickies products and names are copyrightsï¿½ and trademarks of nFinity, Inc.